GLOBBA'S AND FLOWER- BULBS AND RHIZOMES. TRACHYCARPUS PRINCEPS "GOLDEN LOTUS" SEEDS AND PLANTS. 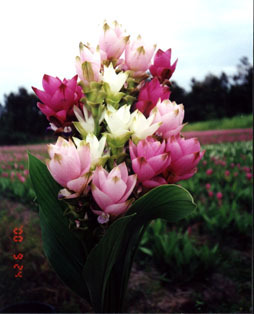 We are a Dutch company, thelargest exporter of Curcuma's, Globba's and other rhizomes from Thailand. We are famous for our good quality. One million rhizomes are exported every year to Holland, Australia, Brunei, Costa Rica, Equador, Italy, India, Japan, Korea, Nepal, Pakistan, USA and Surinam. 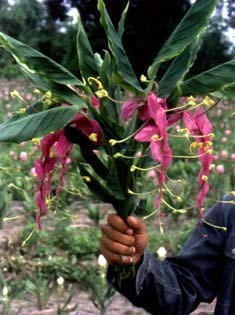 No-one has such a great variety of different flower-rhizomes and flower-bulbs in Thailand. Good quality and good prices! About this no-body can beat us, we know what we are doing to please our customers. We are also famous for seeds and plants of the real Trachycarpus princeps "Golden Lotus". We are the first who introduce this palm into cultivation! We wish you best growing!